What would you do when 12 billion people on Earth suddenly disappeared overnight, including your parents, friends and family? How would you feel when you’re the only one left on your street. One of only a few survivors left in your once overpopulated city? Panic, confusion, fear. These were all themes that arose in At The End, and rightly so. The story opens up from the perspective of Darrel, who seems to be going through his normal routine until a wild lion bursts through his back door. He freezes at the sight, thinking his death was imminent and that all the time he’d spent playing video games never prepared him for this moment. At the last minute, his best friend Felix comes in and kills the beast. They both start to figure out that the reason behind their survival might have something to do with having tin foil placed over their beds as a joke, and sets off to find their friend Maggy, who was also in on the joke. Having had experience of war and fighting through their video games, the three are smart enough to have some survival instincts. Especially Maggy, also known as IQ, in the group. They gathered as many weapons as they could before heading out to find a friend who’s dad worked for NASA or a similar organisation I believe. I was impressed that they had such a solid plan, especially in the conditions they were thrown in, one that could evidently save the world. But their journey down the West coast towards this destination was not a smooth one at all. In this alien invasion, all three along with the companions they made on the way, were tested to the brink of insanity all in an effort to survive. The novel alternates between Maggy and Darrel (aka. Jelly). Both have very distinct personalities and voices and I enjoyed reading through both their perspectives. Maggy is a strong-willed character, who is extremely smart but find it hard to express her emotions easily. She is brave and knows how to take charge, stepping up as the leader most of the time. Darrel on the other hand was an anxious boy that relied heavily on his asthma puffers in order to stem his panic attacks. I found him to be an extremely weak character, and this weakness was evident in a lot of his actions throughout the book. But his confidence does build, and he has a few heroic moments as well. I really enjoyed Hennessy’s portrayal of these characters as he shows that women are not weak, and men can be the ones that require saving sometimes. This theme isn’t only highlighted through Maggy and Darrel, but through the other supporting characters such as Penelope. The plot was extremely fast paced and I found myself on the edge of my seat from the very start. It was intense following the characters around, being left as much in the dark as them and feeling the same fear and panic through every step they took. There was a lot of death – understandably – and you feel the loss each time because you’re rooting so much for these people. For your fellow human beings, even though they’re fictional. The mystery of the alions (aliens who look like lions) kept me on the edge of my seat till the end as well. It was horrible not knowing what their motive was, and why they decided to basically wipe out Earth entirely. These creatures were far more advanced than anyone imagined, and their attack brought the world to their knees. This was mainly due to their ability in making billions of people disappear without a trace, and no one being able to figure out how. One of the first issues I found was the tin foil explanation – or lack-there-of. I find it hard to believe that could be the sole reason for the survivors. How did all their parents disappear from the same house, while they survived thanks to some tin foil placed above their bed. This was definitely not explained properly as the military base was also explained to be safe due to having been made with tin foil in the walls, yet it was still attacked regardless later on. The second issue is just minor, but it was annoying. Towards the end of the novel, one of the soldiers (Albonese I think) who was described to be female was suddenly referred to as male. This really halted the flow of the story, especially when I was so close to the end, as I had to flip back to make sure I wasn’t imagining things. And I wasn’t. I understand this is just a small issue, but it really impacts on the flow, and that’s never a good thing. But all-in-all, At The End was a very good portrayal of the end of the world and an alien invasion. The characters were all drawn out realistically and the plot was nice and fast, just the way I like it. I actually really like when the novel ends, so I’m not sure how I feel about this only being the first book in a series. I really want them all to have their happy ending, but only time will tell whether I’m brave enough to go through this rollercoaster of emotions again. 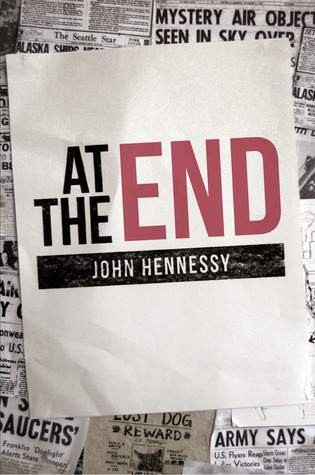 Many thanks to the author John Hennessy for kindly providing an electronic copy of his book in exchange for an honest review.